Kimchi Fried Rice, a popular staple in South Korea is a delicious one pot (wok) meal. Plenty of umami from the bacon, soy sauce and fish sauce meets the funkiness of the kimchi to create an excellent hardy meal. Easily throw this together with leftover rice from the night before or, if you are like me, go out of your way to make rice early just to have this dish. Tip: Preparing and measuring all of the ingredients before you begin cooking makes this recipes go incredibly smooth. If you are not using leftover rice: Cook 1 cup of dried rice and store in the fridge until you are ready to begin. Dice the bacon into half inch pieces and add to a large wok over medium heat. Stirring occasionally until the bacon is crispy. Remove bacon and let dry on a paper towel. Adjust the heat to medium high. Add the diced onion to the bacon fat and cook until translucent about 2-3 minutes stirring occasionally. Add the chopped kimchi and cook for 1 minute. Add the rice wine vinegar to deglaze making sure to scrap the wok with a wooden spoon to remove the stuck on bits. Next, the rice is added and stir everything to combine breaking up any large chunks of rice. Stir in the soy sauce and the kimchi liquid. This should help break up and remaining chunks of rice. Add the peas stirring to combine. Create a well at the base of the wok by pushing the rice mixture up the sides of the wok. Add the 2 eggs into the well. Stir the eggs constantly with a wooden spoon in the well making sure to scrape the eggs from the bottom of the wok if they are sticking. Once the eggs are starting to solidify collapse the well with the rice mixture and stir everything to combine. Remove from heat and add the fish sauce and cooked bacon. Stir to combine. 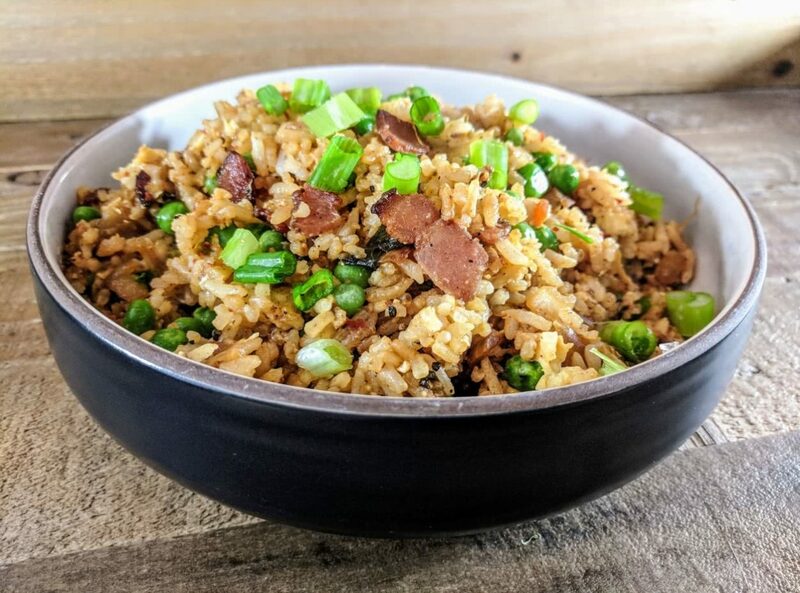 Plate the fried rice and top with scallions.